Kirstie Allsop hosts a TV show called in ‘Made in Britain‘. It is basically an outlet for over-achievement. She tries her hand, guided by experts, at all kinds of craft and baking and enters the results in small town fairs, where she usually wins some kind of prize amongst people who have been plugging away for years. It sounds like I don’t like her or the show much, but I do. I really like her, she isn’t afraid to reveal her competitive streak, which I understand all too well. My family call it the ‘Monica gene’ (from Friends) and unfortunately we all suffer from it. Board games in my family never went down very well. So I was watching one episode where she was making scones. I heard the chef who was helping her, mention an ingredient that he uses to hold the mixture together and achieve that spongy texture. My ears pricked up at that because I had always thought my scones were rather crumbly, but as usual I missed what he said – probably because AT was talking. Mum’s always said my scones remind her of her mother’s scones. Probably because I use the Edmonds Cookery book recipe, which is a New Zealand publication and she grew up in New Zealand. After the show I Googled like mad and found the recipe from the show that chef Richard Hunt uses at his restaurant in Torquay. The secret ingredient was milk powder. 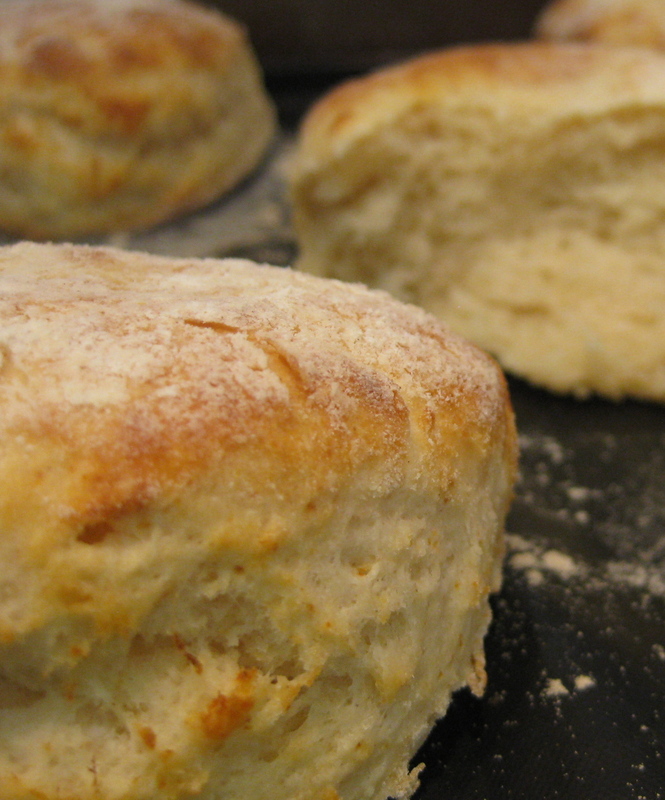 He also uses buttermilk, which I found made slightly sour scones. But his recipe did indeed produce a less crumbly result. I have included his method here, but I made it the way I always do (which is whiz together flour, salt and baking powder to mix, then add butter till I get ‘fine breadcrumb texture’. Then I transfer to bowl and cut in the liquid with a knife till just combined) and got good results. I even tried cutting the scones out this time, as they do here in England. 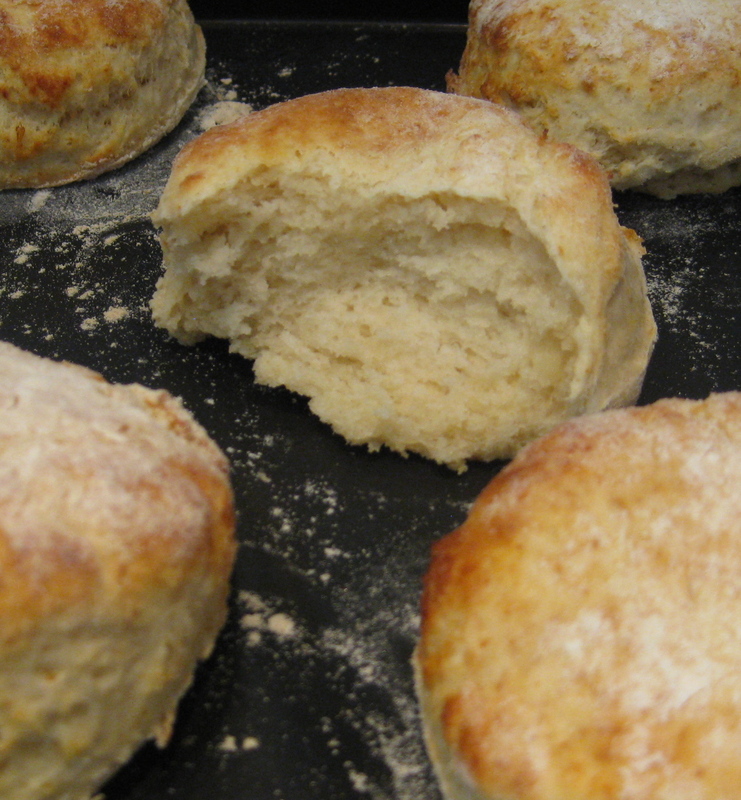 I usually leave the dough in a heap on a tray, and cut the dough with a big knife, creating rough scone shapes. But these round ones looked neat and tidy. It is a good recipe, I would recommend it. But there is something I like about my old scones. I like their odd shape and bumpy texture. As long they’re light and fluffy, they’re good scones in my book. They really just provide an opportunity to scarf inappropriately enormous lashings of jam and cream. I’m sure we all agree on that point. In a bowl put the flour, sugar, salt, butter, baking powder and milk powder and rub it together with your fingertips until it turns cream coloured and slightly crumbly. The odd fleck of butter is not a bad thing. Add the buttermilk then stir this into the flour. Bring together into a firm ball of dough, and knead lightly for 10-15 seconds – no more or the dough will be tough. Flour the surface again and the top of the dough and roll to 4cm thick. Cut into rounds using an 8cm round cutter. A quick downward cut will give you the best rise in the oven. Place on a parchment lined tray a few centimetres apart and bake for 15-20 minutes until risen and lightly coloured. I think the key to good scones is really not to over mix or handle them, once they’re wet and combined the less handling the better the result but then as you said the scones a just a vehicle to justify eating jam and cream, just ask Lenny. Recipe looks great and have all ingredients to hand so must give them a go. I went to a High Tea in Sydney last Sunday and had the most disgusting mini scones that I am sure would have caused damage had they been thrown! How can restaurants get it so wrong? By the way I just love Kirstie in that program, I watch it on Foxtel, she is just so everyday, down to earth. Recipe looks great. Im keen to make for an event this weekend. Does anyone know how many scones this recipe makes? Hi Sonia, depending on how many people you’re feeding, you could just make 2 batches and then cut the scones smaller, so more people can try them. You could probably share amongst 5-6 people on one batch. I just watched an episode of one of Kirsty’s programmes which had Richard Hunt guesting and showing how to make his scones. Kirsty says to cook the scones at 180 deg for 12 mins. The same recipe – shown above – says to cook at 210 deg for 15-20 mins. CONFUSED. I only looked it up as presenters don’t always say whether the temperature of the oven refers to a fan oven or not. I would appreciate knowing which recipe is correct please. Hi Hazel, thanks for your comment. I had a dig around for where I might have found the 210C oven temp and I noticed some other bloggers sharing Richard’s recipe also listed 210C. But I found the original posting, on Richard’s own website, (http://www.devonheavenhampers.co.uk/blogs/news/34692037-how-to-make-a-perfect-scone-by-the-devon-scone-company) and changed it to 190C as he recommends/175C for a fan oven. However – all ovens are different, so it’s best to adjust the temperature to however they cook best in your oven. I hope this helps.